The Lawnmower Blenny's (Salarias ​fasciatus) name pretty much says it all. This Blenny is the king of algae-eaters in the marine aquarium hobby. The Lawnmower Blenny devours Green Hair Algae at a fantastic rate in an aquarium. It is also known as: Algae Blenny, Jeweled Rockskipper Blenny, Sailfin Blenny, Jeweled Blenny and Rock Blenny. This Blenny is a favorite with saltwater aquarists. A terrific algae eating fish, this Blenny will entertain you all day long as it plows through patches of algae and flits from rock to rock in an aquarium. In the wild, the Peacock Blenny (Blennius Pavo) is found on the eastern Atlantic coast from France to Morocco, as well as in the Mediterranean and Black seas and in the Suez Canal. It reaches a length of about 5 inches. Be sure to consider its compatibility with other fish before ​adding one to your tank. The Horned Blenny (Hypsoblennius exstochilus) originates in the Caribbean Ocean and reaches a maximum length of about 2 1/4 inches. This Blenny is a herbivore, feeding on algae. 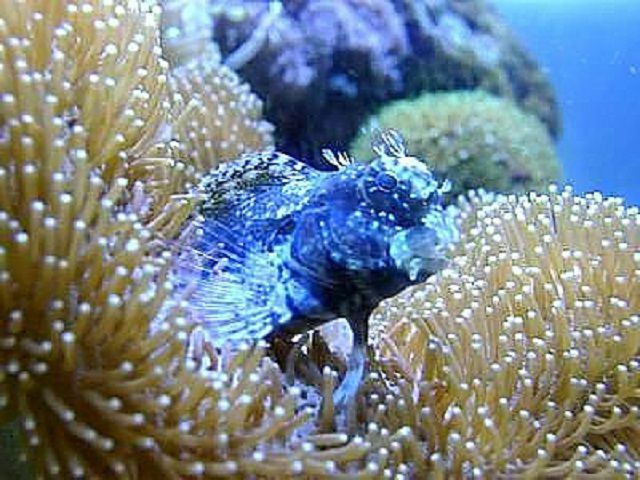 The Horned Blenny is reef tank safe and gets along well with most other fish. The Red Spotted Blenny (Blenniella chrysospilos), also known as the Orange Spotted Blenny attains a length of about 5 inches and is found in the Western Indian Ocean, Micronesia, and Hawaii. This Blenny is common in the surf zone living in empty worm-snail tubes. The Bullethead Rockskipper Blenny (Blenniella gibbifrons) is common on shallow reefs, living in empty vermetid tubes. Their base color is green in females and gray with reddish brown in males. It attains a length of 5 inches. The Ewa Fangblenny (Plagiotremus ewaensis) is endemic to Hawaii and has an elongated orange-brown body with two neon blue stripes and clear orange fins. This fish lives in vermetid snail tubes and pretends to be a cleaner wrasse and bites chunks out of other fishes. It attains 4 inches in length. The Gosline's Fangblenny (Plagiotremus gosline) lives in vermetid snail tubes and pretends to be a cleaner wrasse, biting chunks out of other fishes. It attains 4 inches in length. The Gosline swims like a cleaner wrasse with a bouncing action to attract unwary fish which are then bitten, the sharp incisors taking a chunk of flesh. It is endemic to Hawaii. The Marbled Blenny (Entomacrodus marmoratus) is endemic to Hawaii and is common in the intertidal zone. It has been observed on exposed rocks at night, possibly grazing upon algae. It attains 6 inches in length. Seaweed Blennies of various species are found in tropical Atlantic and Indo-Pacific waters. This Blenny can help control nuisance microalgae in an aquarium. It spends most of its time sitting on the substrate, not bothering its tank mates. It may be aggressive towards same species. Due to its specific diet of small polyp stony coral in the wild, the Shortbodied Blenny (Exallias brevis) is not recommended for hobby aquariums. In the off chance that it can be coaxed into eating Mysid Shrimp or Brine Shrimp, this Blenny will live peacefully with its tank-mates. Additionally, it would need to be converted to living in fresh water. The Hawaiian Triplefin Blenny (Enneapterygius atriceps) is endemic to Hawaii and commonly found on reefs with algal growth but difficult to see. Only 1 inch long, the males are reddish with a dark head, females green with light blotches. The Scarface Blenny (Cirripectes vanderbilti) is endemic to Hawaii and very common on shallow reefs but darts into holes when approached. This Blenny is dark brown with red eye ring and lines on the head and attains 4 inches in length. The Browncheek Blenny (Acanthemblemaria crockeri) is endemic to the Gulf of California, is a carnivorous fish that inhabits empty worm or bivalve shells or barnacles in the wild. The Barnacle Blenny (Acanthemblemaria macrospilus) is a carnivorous fish that inhabits empty worm or bivalve shells or barnacles in the wild. It inhabits the waters of Southern Baja California to Acapulco and the Revillagigedos and attains a length of 2 1/2 inches. The Gargantuan Blenny (Cirripectes obscurus) is endemic to Hawaii. Most are herbivorous, using comb-like teeth to graze upon algal turfs but Plagiotremus are carnivorous, with large incisors that take chunks of flesh from unwary fish and the occasional diver. Many species are cryptic or inhabit the surge zone. Hawaiians called them Pao'o. It attains a length of 8 inches. The Lizard Triplefin (Crocodilichthys gracilis) is endemic to the Gulf of California. It is common on rocky reefs and dropoffs and attains a length of 2 1/2 inches.